I specialise in result driven pampering treatments, and advanced skin revision, and have the firm belief that every skin needs an individual approach, in order to achieve optimal results. Therefore I would recommend you discuss your requirements with me, before deciding upon a particular treatment, in order to guarantee that your expectations will not only be fulfilled, but exceeded! This powerful peel with zero peeling effect, was first created by Christine Schrammek more than 60 years ago. Its basis is a mixture of eight specific herbs containing enzymes, minerals and vitamins, which are massaged into the skin. 100% natural, GREEN PEEL® Energy provides your skin with the natural energy it needs to renew the cells. It stimulates blood circulation and metabolism and thus leads to a natural improvement of the skin texture without any peeling effect or downtime. Reducing age-related skin appearances as well as impurities, scarring and pigment disorders. The treatment visibly improves the skin’s appearance and harmonises its surface, while simultaneously tightening and firming the face & neck area. Ideal as a repeated, intensive salon treatment of four sessions 2 – 3 weeks apart. Biotulin Supreme Skin Gel was first made famous by Duchess Kate, who recommended it since to Michelle Obama & her sister in law Duchess Meghan. 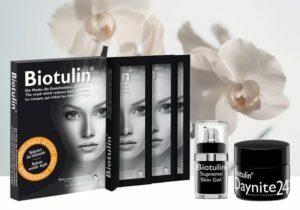 This world’s first facial using the Biotulin range is now available at Alegria Beautyfarm. This amazing treatment is taking advantage of the main active ingredient Spilanthol, an extract of a herb Paracress with similar effect as injections of Botulinum Toxin. However it is not working on the nerve endings but relaxes the muscle/s. The content of Blady Grass and Hyaluron is filling up your skin’s moisture level and act like fillers. The treatment leaves your skin firm and deeply moisturised. More info and to learn more how Biotulin works? DECLÉOR Aromatic Face Rituals | SKIN. BODY. MIND. DECLÉOR’s holistic approach to beauty combines quality and excellence using 100% pure Essential Oils with natural Plant Extracts. The face and body skin care products and professional treatments are designed to work in harmony with your lifestyle, relaxing mind and body for the ultimate rejuvenation experience. Each of our treatments features the distinctive DECLÉOR style which you will find in DECLÉOR worldwide: A complimentary welcoming Aromatic (back) Massage Ritual with DECLÉOR AromessenceTM & arm/hand massage during tailor-made treatments. (Also included is an eyebrow tidy – $10 add on for new shape). The price for the following ‘Expert Facials’ ranges from $170.00-$175.00, duration between 100-120 minutes – depending on individual products/steps required for each skin. This nourishing treatment with essential oils of Roman camomile, angelica & geranium immediately nourishes and comforts dry, flaky skin, replenishing & reinforcing the skins barrier, enabling it to combat harsh external aggressions, leaving the skin soothed. An intensive purifying treatment with essential oils of ylangylang and tea tree, tightens open pores & clears away blackheads, leaving the skin clearer and more luminous. This wonderful calming treatment brings immediate comfort to stressed skin. The skin is soothed, rebalanced & redness is reduced, leaving the complexion smooth and cool. This intensive treatment harnesses the benefits of pure Vitamin C and the White-Bright Complex to reduce appearance of pigmentation and brighten the entire complexion for truly radiant skin. This ultimate solution to combat third signs of ageing is excellent for anyone who is concerned with deeper, well established wrinkles, pigmentation and loss of energy in the skin. The liss age mask with plumping sap gives magnified results, leaving the facial contours refined, skin plumper and deep wrinkles smoothed. A classic treatment tailored to every skin type; designed to rejuvenate and relax. Ideal as a ’first-time-ever’ facial, or for very young skin. This prescriptive facial is tailor made to every skin type and is an indispensable treatment step to restore perfect balance and essential well-being to your skin. A multi-vitamin treatment with a delicious and surprising texture which comforts, nourishes and relaxes with 100% natural flax seeds, wheat germ and sunflower seeds. Founded by Dr. Peter T. Pugliese, a pioneer of cosmetic research, education and formulation in the USA since the 1970’s. His range bottles his philosophy that the amalgamation of science and nature gives us the fundamental concept for creating products for skin, health and longevity. Only ingredients proven by science are used in the formulation of Circadia. These rapidly acting treatments, all have specific applications, with their own divine smell of Raspberry, Cocoa or Citrus, suiting each skin condition. These enable instant exfoliation, brightening and rebuilding of your skin. An Enzyme treatment is to be followed by other treatments such as Red or Green Tea Masks, or Oxygen Treatment. Safe for all skin types and high in antioxidants to fight free radicals, which can cause ageing, pigmentation and sunspots. These masks purify, nourish and soothe, leaving even toned skin. Formulated to deliver a measured and controlled amount of Oxygen to the skin, ensuring maximum benefit . Due to its antibacterial properties, ability to stimulate Collagen and Elastin production, lightening and vaso-constricting capabilities, it produces outstanding results on Acne, Rosacea, Teleangiectasia and sun-damaged skin. If a course of treatments is booked, different price applies. A KLAPP treatment is chosen to suit your skin needs and includes a back massage. All it takes is a swab from the inside of your cheek which is sent to the lab. Receive your personal SkinDNA report to to uncover what your genes reveal about the future of your skin, and use this information to select the perfect skin care products, as prescribed by science. Swab, report, analysis, consultation & prescription. An oil-based table massage, using a style of deep tissue touch, combined with long kneading, soothing strokes and energy awareness. A session of this massage is enough to leave you feeling relaxed, refreshed, rejuvenated and re-energised. It will improve your clarity of mind, calm your nerves and balance your mental state. Relaxes the vulnerable areas of the back, neck and shoulders where tension immediately accumulates, using different massage techniques and aromatherapy to relax and unwind. When incorporated within a facial (over 60 min), lower prices apply. Depil-8 is a professional hair removal system designed for facial hair. Not suitable for Indian, Asian and very thin skintypes. Being a small business, cancellations have a significant impact on us, therefore we need to apply our cancellation policy and trust you understand our need to do so. Therefore, please advise us at least 24 hours prior to your appointment if you need to change, cancel or reschedule your appointment, otherwise a cancellation fee of 100% of the cost of the treatment will be charged, or your gift voucher fully redeemed. As we want you leave Alegria Beautyfarm as relaxed as possible, we kindly request that you ensure your mobile phone is switched off during an appointment.